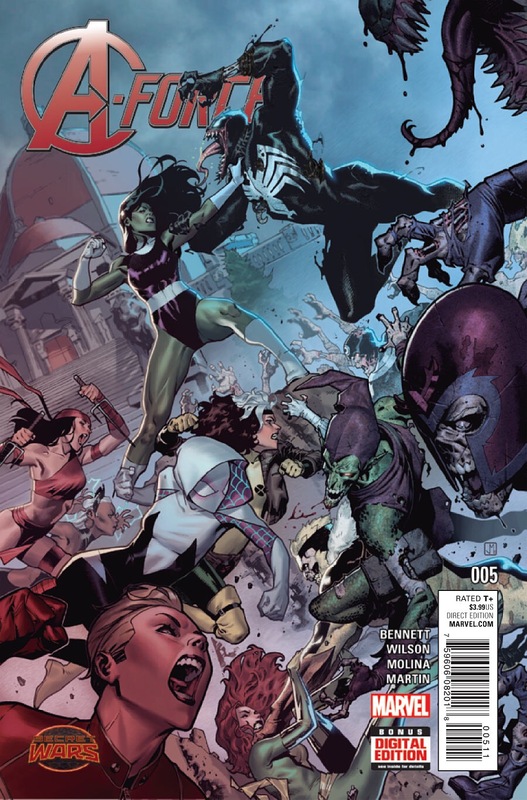 While the fourth issue of Marvel’s A-Force struggled to pack all the necessary storyline developments into its limited page count, its concluding chapter actually seems to go in the other direction, with very little happening for the bulk of the issue. Well, nothing besides an admittedly pretty damn cool ‘female heroes versus zombies’ smackdown, that is. It’s not clear how much of this conclusion was editorial mandate and how much was fan-service on the part of the creators, but the shoehorning of pretty much every hot female character of the moment (Ms. Marvel? Check. Spider-Gwen? Check.) into the battle did feel more than a little forced, and detracted from the conclusion of what had been a fairly engrossing story to this point. Don’t get me wrong, the notion of the entire population of Arcadia rallying to defend their paradise home from the marauding zombie invaders is an impressive one, and artist Jorge Molina was clearly having an absolute blast with the possibilities provided to him, but for me, the strongest aspect of A-Force to this point had always been its quieter, emotional, character-based moments. We still got a little of that, with Bennett and Wilson providing a poignant and pleasingly open-ended conclusion, but would perhaps preferred a little more of the meaningful characterisation and a little less of the wise-cracking battle banter. If it sounds like I’m being overly critical, well… perhaps I am, but only because the early issues of this series were positively crackling with such energy, emotion and enormous potential. I still thoroughly enjoyed this issue, particularly the exchanges between She-Hulk and Nico, and it bears mentioning once again that Jorge Molina’s artwork is perfectly suited for a bold, lively superhero story like this. Overall, in spite of my minor niggles, A-Force stands as one of the most enjoyable Secret Wars series’ that I’ve had the pleasure of reading, and I can’t wait for the ongoing series to still come. It’s a little disappointing that Bennett won’t be returning for volume two, but I have no doubt that the series will continue to flourish in Wilson’s capable hands. Definitely one to pick up the trade of, if you happen to have missed out on the single issues.